Is A Hip Fracture a Sign of Nursing Home Neglect? It is a tragic reality that it does not become clear that a loved one was neglected in an Illinois nursing home until after they are seriously injured. All too frequently nursing home residents are transferred to the hospital for treatment of a fractured hip. Hip fractures in a nursing home are almost always the result of some form of neglect. Falls are common in nursing homes, with devastating consequences for residents and their loved ones. In particular, fall-related injuries including hip fractures are among the most serious health issues facing facilities and their patients. Hip fractures may result in hospitalizations, pneumonia, and sometimes death. Hip fractures represent 40% of all serious fall-related injuries in nursing homes. On average each nursing home resident falls between 1 and 4 times per year. Patients with dementia experience falls at nearly double the rate of patients without cognitive impairment, averaging more than four falls per year. Furthermore, nearly 35% of fall related injuries occur in residents who are bed or wheelchair-bound. According to the Centers for Disease Control and Prevention, between 16 to 27% of nursing home falls are a result on environmental hazards. Environmental hazards include poor lighting, slippery or wet floors, debris in walkways, and improper exit signs. Faulty bed rails and incorrect bed height accounts for close to 30 percent of nursing home falls nationwide. A well-run and effective nursing home should be able to prevent the majority of these incidents. It is of the utmost importance for nursing home staff to be attentive at all times and respond to call lights, especially to patients who suffer from cognitive impairments. The nursing home had a duty to protect your loved one from falls. If your loved suffered a fractured hip in an Illinois nursing home contact an experienced Chicago nursing home neglect attorney to evaluate your case. 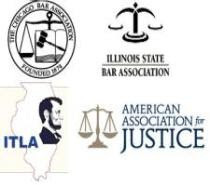 If you have a question about this post, or any other issue related to Illinois personal injury law, please contact Illinois Nursing Home Abuse and Neglect Attorneys at Keating Law Offices. You can contact Mike Keating directly by calling 312-208-7702 or emailing MKeating@KeatingLegal.com, 24 hours a day, 7 days a week. All phone calls and emails are returned promptly. All initial consultations are free and confidential. The daughter of a former resident of a nursing home in Chicago's south suburbs has retained the law firm of Keating Law Offices to investigate her mother’s death. Her mother suffered a Stage IV sacral pressure ulcer resulting in a severe infection and death. The Chicago Nursing Home Attorneys at Keating Law Offices are very familiar with the particular nursing home. “Our firm has successfully resolved several cases against this nursing home involving allegations of failure to prevent bed sores in recent years,” said Attorney Mike Keating. All nursing home have a duty to implement interventions (actions for nursing staff to take) necessary to prevent pressure ulcers from developing and provide safe living conditions for each of its residents. Pressure sores are preventable. Proper nursing care can ensure residents do not sustain pressure ulcers. All too often, nursing staff fails to turn and reposition residents, provide proper mattresses, or provide nutrition necessary to prevent skin breakdown. The failure to prevent and treat a pressure sore may result in fatal infection. In this case, the resident developed sepsis which ultimately lead to renal failure and death as a direct result of her large open pressure sore. If your loved suffered a bed sore, injury, or death at a nursing home in Chicago, the suburbs, or elsewhere in Illinois please contact an experienced Chicago nursing home neglect attorney to evaluate your case.